Finally Unlocking the Blood Ravens armor in WH40K Space Marine? Is there a way I can use CE to unlock the Blood Ravens armor in Warhammer 40,000: Space Marine? The DLC all appears to be "on disc", with most of the game's armors bound to client side data. I saw where some modders have managed to do similar things on other games with CE (accessing abandoned DLC). I finally revisited this game after a few years, and I was disheartened that they STILL have not released the Blood Ravens armor for purchase on Steam. Back when I first got this game, I bought all the DLC immediately, and but the Blood Ravens (one of my fav chapters) was still locked. It was for sale on the console versions, but on PC it was never released. I would be more than happy to purchase it, if it ever was released. Re: Finally Unlocking the Blood Ravens armor in WH40K Space Marine? Same. They released the pack on PS4, but Xbox and PC had a problem where they released Blood Angels instead of Blood Ravens (which is a ripoff, because we get Blood Angels in a different pack (I also own xbox and pc, so rip me -.-)). I tried asking on another forum and I got 'locked' lmao. Would love to get an answer as well, I own literally everything there is to buy in Space Marine and the Blood Raven armor is the one thing I actually want. There is no Blood Raven armour set, it's Blood Angels. I've played since release and have never once seen a Blood Raven set, so if you know it's a thing on consoles then it's console exclusive. If you know of the Blood Angels armor and are a veteran of this game, you should know of every other armor on that page, including the Blood Ravens. I'll upload a picture to prove this. Anyways, it was first only available via pre-order, but later was released as a 'dlc' skin, same as all the other skins we got. However, there was a bug that someone thought the Blood Ravens armor was the Blood Angels (which you can see this by visiting the page for the Blood Angels armor, as the icon shows a Blood Ravens armor there instead of the Blood Angels https://steamcdn-a.akamaihd.net/steam/a ... 1522071298), which was never fixed on Xbox and PC, but they fixed that bug on PS3. So PS3 users have access to purchasing the armor, but we aren't, due to that bug. 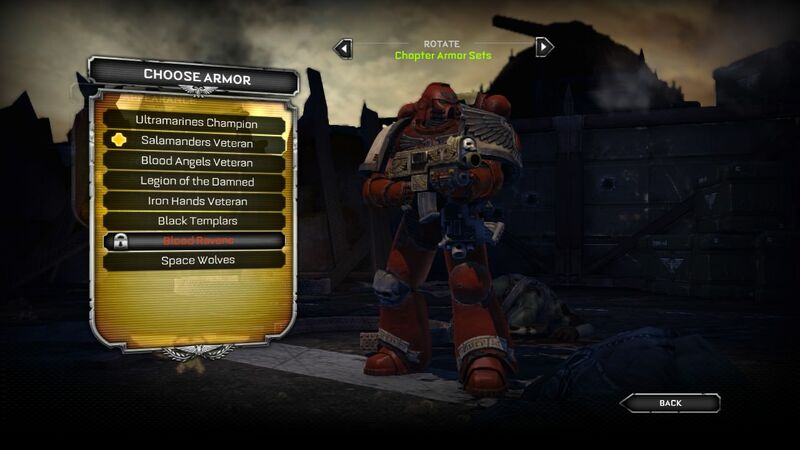 What's even more disturbing is that the Blood Angels armor used to come in the Emperor's Elite pack, since I obtained the Emperor's Elite along with my copy on Xbox, which came with Templars, Space Wolves, and Blood Angels. But on Steam, it only sells the first two with it.